Rapid Pack can be worn above the jersey. 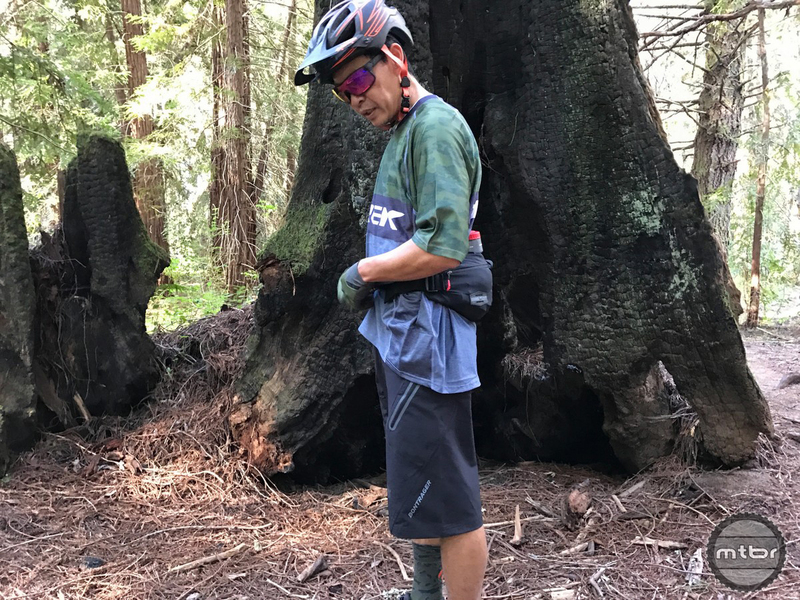 The fanny pack is as old as mountain biking itself but it seems to have found new life in the last couple years with the growth of all mountain and enduro riding. 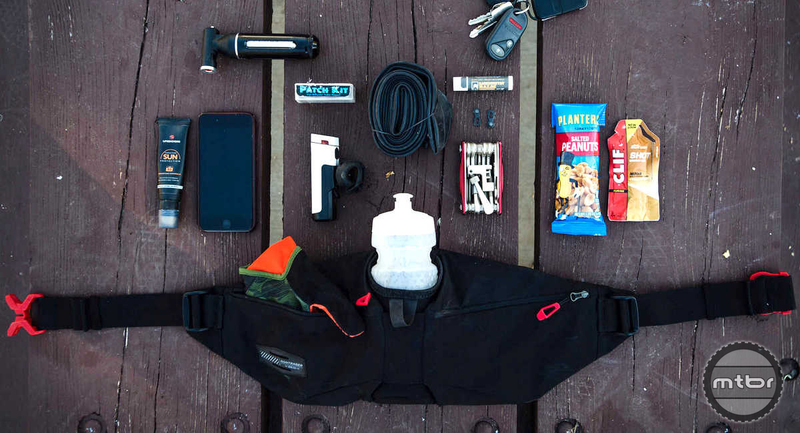 Folks have to carry a few essentials but they may not necessarily want a full hydration pack on their back. Issues of ventilation and shift in center of gravity is a concern for some riders. 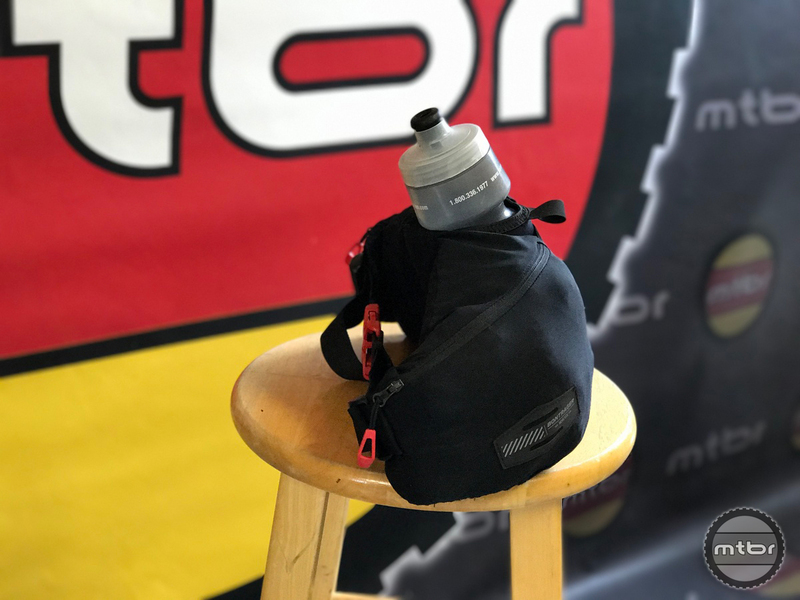 So Bontrager went out and created their fanny pack called the Rapid Pack. 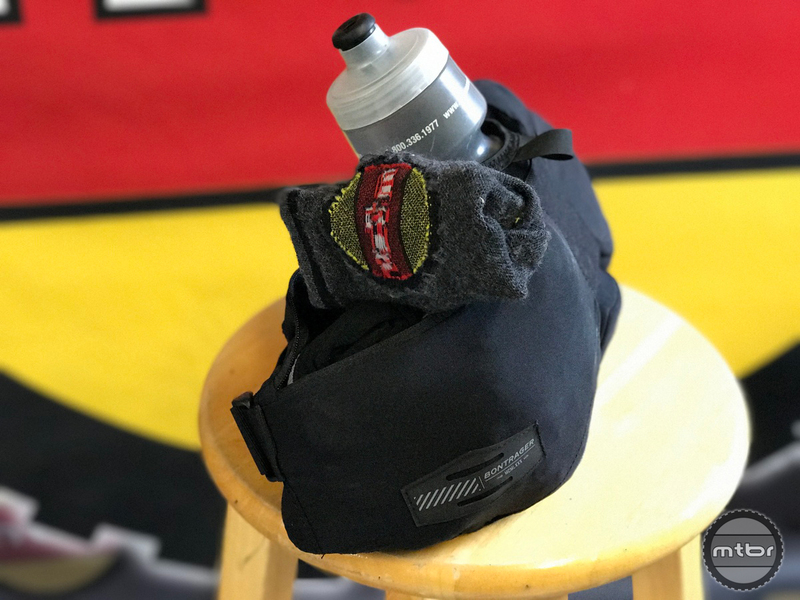 It features two big, expandable pockets and a water bottle holder in the middle, and has a 100 cubic inches (1.364L) capacity. Press play to learn more. As you can see in the video above, this pack carries any size water bottle. Or it can carry just a phone, wallet, and keys securely. It can also be stuffed to the gills with tools and clothing. In any configuration, it seems to perform well without calling attention to itself. Carrying a bottle is made easier by a hook strap to hold open the bottle holder. Bottle cap can possibly injure a rider due to its placement. 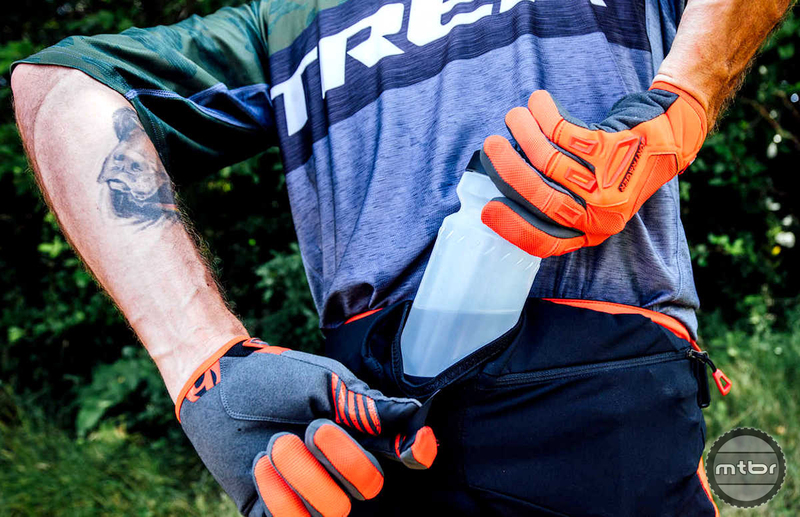 We’ve had a recent love affair with water bottles, demanding one on the frame and for long rides, on the back. We either put it in one of the new SWAT bibs jersey pocket or in a fanny pack. So we’re pretty familiar with the fanny pack category, having tried a few. Carrying a bottle is easier due to the hook strap to hold open the bottle holder. The best thing about the Rapid Pack is its comfort and suitability to task. 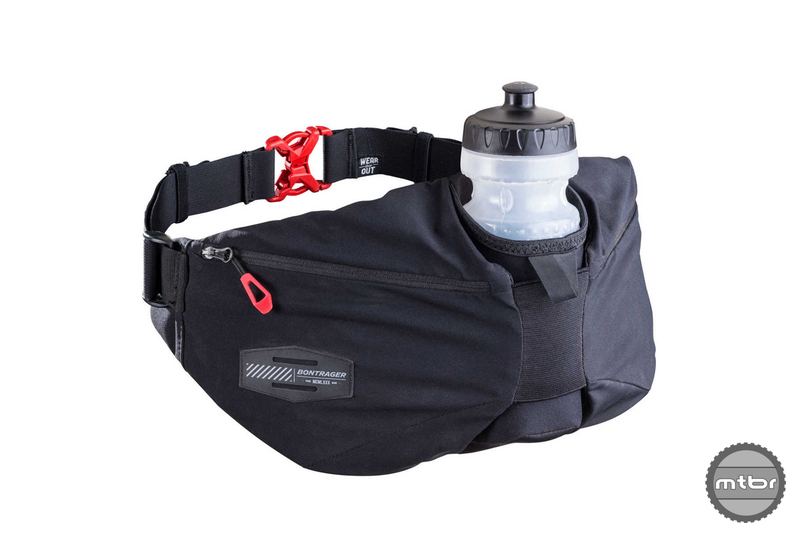 A lot of fanny packs can be uncomfortable or bounce around in technical descents. They seem to be either too tight or too loose. But the Rapid Pack strikes a nice balance with its wide, padded profile. And more important, most of the material is segmented and stretchy. Thus, it conforms to the back well. It conforms to your cargo as well. Don’t want to carry a water bottle? No problem. Want to carry just wallet, phone and keys, that’s good, too. And they will be accessible and will not rattle if placed in the proper compartments. Want to carry a lot of stuff? That’s where this pack showed its range as it stretches with the demands of the cargo. It is quite surprising how much stuff can be carried. 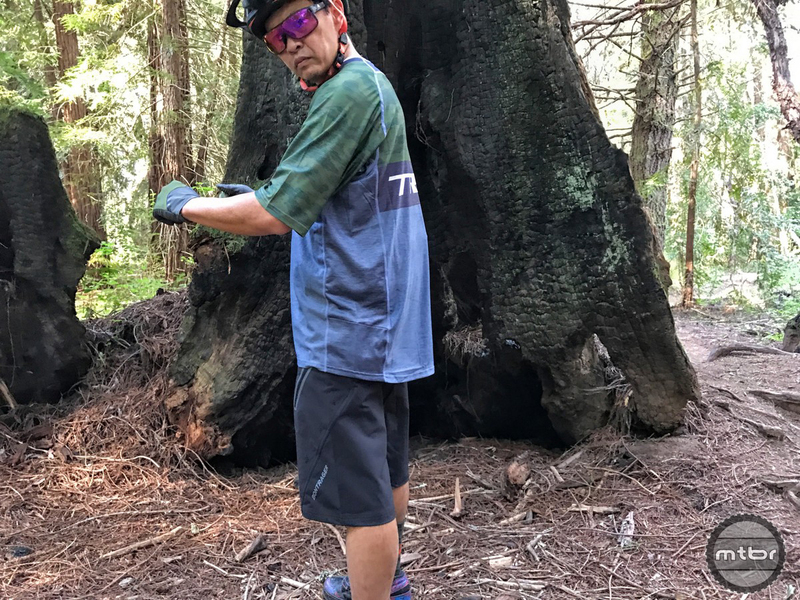 For kicks, we put in biking socks (rolled into a ball) since that’s a size that all mountain bikers are familiar with. We were able to stuff in 14 pairs of socks without much of a problem. Waist tension is very easy to adjust and it’s very natural (and dorky) to rotate the pack to the front so one can see and access the gear. Packed lightly, it’s very thin and stealth. Fully loaded, it grows and takes the shape of the gear. And finally, the rider has the option of wearing it over a bike jersey or underneath. Rapid Pack is shown here loaded with 14 pairs of socks to illustrate max capacity. Rapid pack is shown here under the jersey. This is best done with an an underlayer shirt for comfort. Putting a bottle is made easier by a hook strap to hold open the bottle holder. Rapid Pack is shown here loaded with 14 pairs of socks to show capacity. Here it is with one of the 14 pairs of socks stuffed in. Rapid Pack with bottle mounted. Just Add an water tight storage area for the cell phone, etc. and it will be perfect.